Meningioma Presenting As A Mass In The External Auditory Canal. V Hemanth, V Sreenivas, J Chaturvedi. Meningioma Presenting As A Mass In The External Auditory Canal.. The Internet Journal of Otorhinolaryngology. 2010 Volume 13 Number 1. Meningiomas presenting as an intracranial neoplasm are relatively common. (15–18%).However, primary extracranial (ectopic, extracalvarial) meningiomas of the ear and temporal bone are rare, making up for less than 1% of all meningiomas. 1 The known female preponderance of intracranial meningiomas is also seen in the external auditory canal meningioma. They may be primary (very rare) or secondary due to extension of an intracranial meningioma.The possibility of a meningioma should be considered whenever a mass presents in the middle or external ear and a high index of suspicion is needed for diagnosis of such a condition, especially in view of a variety of differentials ranging from benign to malignant conditions.Computed tomography scanning is invaluable, not only for the diagnosis of this condition, but also to see the intracranial extent. 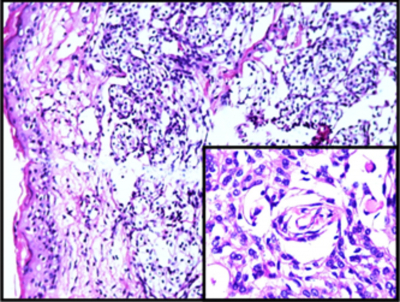 We present a case report of a mass arising in the external auditory canal (EAC), presenting as a meningioma in a 45 year old lady, with review of relevant literature. A 45 year old lady presented to the outpatient department of Otorhinolaryngology at a tertiary referral centre in Bangalore, India, with complaints of swelling in the right EAC since the past 2 months. The swelling was insidious in onset and gradually progressive. It was associated with decreased hearing on the same side since one month. There was no history of trauma to the ear or ear discharge, nor was the patient known to be a diabetic. Examination of the right ear revealed a non tender mass filling the cartilaginous part of the right EAC, extending to the deep meatus. It was firm on palpation. Examination of the other ear was normal. Tuning fork tests and audiometry showed a mild conductive hearing loss in the affected ear. A presumptive diagnosis of a benign soft tissue lesion of the EAC was made, and we proceeded to take an excision biopsy of the mass in the right EAC under local anaesthesia . The section of the specimen under microscope showed nests and whorls of cells with vesicular nuclei having few chromatin and pale eosinophilic cytoplasm. Interspersed with these cells were many vascular channels with hyalinised walls suggestive of findings consistent with meningioma. . (Figure 1). Since meningioma presenting in the external auditory canal is relatively rare, we proceeded to investigate if the meningioma was purely extracranial or did it have an intracranial extension. A High Resolution Computerised Tomography (HRCT) of the temporal bone with contrast revealed an irregular, heterogeneously enhancing lesion, arising from the Petrous part of the right temporal bone, measuring 2.7 x 1.6 x 1.2 cm, and extending into the Right middle and external ear. (Figure 2). She underwent neurosurgical intervention for removal of the petrous temporal bone meningioma and is currently maintaining well on regular follow up. Temporal bone meningioma can be considered as a part of the ectopic meningioma group. The known female preponderance of intracranial meningiomas is also seen in external auditory canal meningioma.4 Up to 20% of intracranial meningiomas may have extraneuraxial extension, 5,6,7,8. including the skull, scalp (all cutaneous sites), orbit, upper airway involvement (nasal cavity, paranasal sinuses, nasopharynx), soft tissues, and ear / temporal bone. However, when the scalp, orbit, sinonasal tract, oral cavity, and soft tissues are excluded, the incidence decreases to <1% 6, 9, 10, 11. Hearing loss is the most common clinical presenting feature in all cases of temporal bone meningioma12. This is related to ossicular chain encasement by tumor, implying a component of surgically correctable hearing loss with appropriate management. Other symptoms include headaches, dizziness, unsteadiness, vertigo, disequilibrium, tinnitus, otalgia, bleeding, “metallic taste,” and a chronic cough. Facial or other cranial nerves may be involved in late cases. Histologically, Zulch et al classifies Meningiomas into three types: a.. Meningothelial meningioma (Endotheliomatous) b.. Fibromatous Meningioma c. Angiomatous Meningioma. 13However, on histology, ear and temporal bone meningiomas are indistinguishable from their intracranial counterparts. 1. Therefore, it probably is best to use a multidisciplinary approach with a combination of intracranial, temporal bone (subtemporal, translabyrinthine, or transcochlear), and skull base (suboccipital) techniques to achieve total resection, possibly including widely exenterative procedures to achieve this end 15,16,17. Meningiomas presenting in the EAC are rare (<1% of meningiomas). Patients most commonly present with complaints of swelling in the EAC and conductive hearing loss. The possibility of a meningioma should be considered whenever a tumor presents in the middle or external ear. A high index of suspicion is needed for diagnosis of such a condition, especially in view of a variety of differentials ranging from benign to malignant conditions. 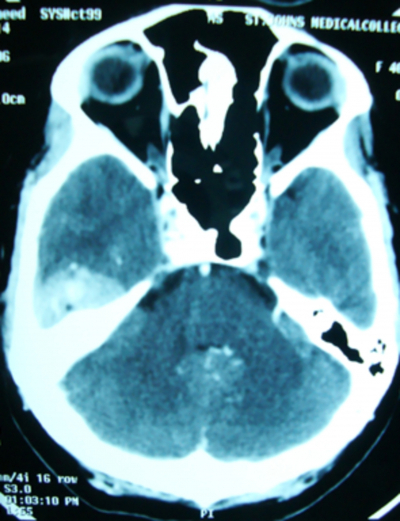 Computed tomography scanning is invaluable, not only for the diagnosis of this condition, but also to see the intracranial extent. Surgical removal is the main modality of treatment, and should be planned with the active involvement of a neurosurgical team. 1. Rafael R, Enrique P, Michael D. An unusual primary intratympanic meningioma. Ear Nose Throat J. Imaging Clinic. Sept 01,2004. 2. Ereρo C, Izquierdo AP, Basurko JM, Bilbao FJ, López JI. Temporal bone secretory meningioma presenting as a middle ear mass. Pathol Res Pract 2006; 202:481-4. 4. A Munshi, D Dutta, D Muzumdar, R Jalali. An atypical presentation of recurrent temporal lobe meningioma with external auditory canal mass Indian journal of cancer. 2007; Vol 44 (3): 119-21. 5. Buehrle R, Goodman WS, Wortzman G. Meningioma of the temporal bone.Can J Otolaryngol 1972; 1: 16–20. 6. Whicker JH, Devine KD, MacCarty CS. Diagnostic and therapeutic problems in extracranial meningiomas. Am J Surg 1973; 126: 452–57. 7. Brookler KH, Hoffman RA, Camins M, Terzakis J. Trilobed meningioma: ampulla of posterior semicircular canal, internal auditory canal, and cerebellopontine angle. Am J Otol 1980; 1: 171–173. 8. Farr HW, Gray GFJr, Vrana M, Panio M. Extracranial meningioma. J Surg Oncol 1973; 5: 411–420. 9. Civantos F, Ferguson LR, Hemmati M, Gruber B. Temporal meningiomas presenting as chronic otitis media. Am J Otol 1993; 14: 403–406. 10. Wolman L. The extracranial spread of meningioma. Eye Ear Nose Throat Digest 1969; 46–57. 11. Brown AM, Fordham KC, Lally ET. Meningioma presenting as an intraoral mass. Oral Surg Oral Med Oral Pathol 1976; 41: 771–776. 13. Zulch K J. Brain Tumors. Their Biology and Pathology. Springer, New York, NY, 1957. 15. Ishikawa N, Komatsuzaki A, Tokano H. Meningioma of the internal auditory canal with extension into the vestibule. J Laryngol Otol 1999; 113: 1101–1103. 16. Langman AW, Jackler RK, Althaus SR. Meningioma of the internal auditory canal. Am J Otol 1990; 11: 201–204. 17. Nassif PS, Shelton C, Arriaga M. Hearing preservation following surgical removal of meningiomas affecting the temporal bone. Laryngoscope 1992; 102: 1357–1362. 18. Stafford SL, Perry A, Suman VJ, Meyer FB, Scheithauer BW, Lohse CM, et al. Primarily resected meningiomas: outcome and prognostic factors in 581 Mayo Clinic patients, 1978 through 1988. Mayo Clin Proc 1998; 73: 936–942.